Dunga’s Brazil side isn’t popular back home. The use of two holding midfielders, the tendency to play on the counter-attack and the overlooking of the likes of Ronaldo, Ronaldinho and Pato have all seen him accused of playing in an un-Brazilian way, by ditching the classic Brazilian principles of yesteryear for a more patient, less spectacular way of playing. All this ignores Brazil’s record since Dunga became manager – Copa America winners, Confederations Cup winners, top of the South American qualifying group – but perhaps Brazil is a country where to win is not enough, you have to win with style. That’s a line of argument to be investigated by someone more knowledgeable about Brazilian football culture, but tens of thousands of Brazilians turned up at the Emirates to watch Brazil take on Ireland, and I was in the stadium to see the Brazil shape for myself. This site has previously commented upon the unusual system Brazil play. Indeed, one of the odd things about the fact the Brazilian team is regarded as rigid and inflexible is the fact that no-one quite knows how to categorise this side. As Jonathan Wilson pointed out last year, South Americans tend to see the system as a 4-4-2 diamond (or 4-3-1-2), in Europe the shape was widely described as a 4-2-3-1. The diagrams on the right show the different interpretations – the players in their ‘actual’ positions, but with lines depicting either formation. So on the right, you have the diamond midfield, on the left you have the 4-2-3-1. Some believe that the system is a diamond midfield, as shown in this picture. The back four marked by red, the midfield diamond by blue (Kaka is slightly to the left-of-centre, his usual position denoted by the blue dot), and the forwards marked by pink. It would be difficult to look at that shape and deny that it was a 4-4-2 diamond – perhaps a 4-3-3 if you were considering Kaka in this picture to be playing as a forward. You would certainly not describe it as a 4-2-3-1, because Ramires (the midfielder furthest to the right) is clearly alongside Melo, the midfielder on the halfway line. And yet, just minutes later in the same game, Brazil had taken this shape, which looks much more like a 4-2-3-1. The defenders again in red, the two holding players in blue, the three attacking players in pink, and the lone forward in green. 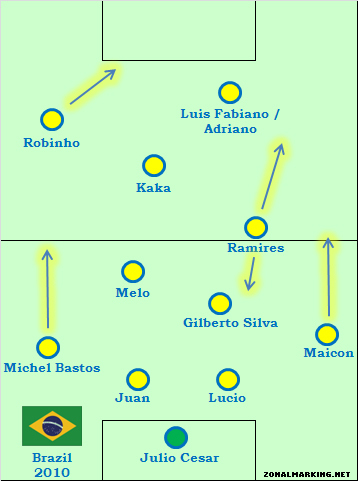 The key to understanding the team’s shift is probably the roles of Robinho and Ramires. Robinho, the left-sided forward, usually takes up a position outside the opposition’s right-back. In this sense, he is effectively playing as an old-fashioned outside-left, whilst the central striker (generally Luis Fabiano who was injured for this game, and replaced by Adriano) occupies the opposition’s left-sided centre-back. Therefore, they play too far apart to realistically be labelled a front two, and they almost never combine. And so the team is actually something like the one shown on the right – what would you define that as? The use of two holding midfielders, Melo and Gilberto, means that Brazil are able to keep possession so easily, because one of them is always free. And Brazil’s game is based almost entirely around possession. Their second goal against Ireland was a wonderful flowing move that featured 21 passes before Robinho put the ball into the net. They like to soak up pressure and do generally play on the counter-attack, and they break at lightning speed – a particular problem for the opposition central midfielders is that they look to close down Gilberto and Melo, which then leaves Ramires and Kaka free. And with Robinho staying wide left and Maicon bombing down the right, Brazil can dominate the centre of midfield with a diamond, without leaving them short on the flanks. Here, Gilberto Silva (normally the right-sided holding player), moves to the right of defence, and becomes a third centre-back alongside Juan and Lucio (the three are marked in red), with the latter becoming a sweeper, with license to move forward. This three-man system with wing-backs is similar to the way Brazil played in 2002. Felipe Melo then becomes the sole holding player, with Bastos and Maicon (marked in pink) able to get forward and provide width high up the pitch. It then effectively becomes an Ajax-style 3-3-3-1 system, with Robinho and Ramires tucking in, narrowing the oppositions, and allowing allow the Brazil wing-backs considerable space to get forward. Robinho (purple) occupies the right-back, whilst Adriano (red) plays on the shoulder of the left-sided centre back. The player inbetween them is the free man. As Ramires (yellow) is in a central position, the right-back Maicon (pink) takes up an extremely advanced and wide role, and to compensate, Gilberto (blue) drops into a position ready to cover the right-back slot, similar to how Javier Zanetti covers for Maicon at Inter. Brazil will be criticized by many over the next few months – every single pre-game chat on the BBC or ITV involving them will refer to this side as being ‘not a classic’ Brazil side, and the pundits will no doubt yearn for the likes of Ronaldinho. But remember, in 2006 Brazil tried to play a front four of Kaka, Ronaldinho, Ronaldo and Adriano, and it completely failed. This Brazil side is functional, organised and brilliant in possession. Don’t be surprised if Brazil quietly fight their way to World Cup victory. They’ll keep the ball, tire the opposition but not look particularly dangerous. Then, late in the game, they’ll break at speed, rely on the skill of Kaka and Robinho, and win games comfortably without thrashing the opposition. This isn’t the side of Brazil side of 1970, 1982 or even 2002, but if you love football, you’ll love watching Brazil. Everything about this Brazil team tells me they’re going to win the World Cup. Everything about recent World Cup history and the misfortunes that typically befall the favourites tells me they won’t. They are devastatingly effective, that 07 Copa America win is still very fresh in my memory. I just hope Portugal doesn’t need to get a point out of them by the time they meet in the group stage! Thank you for yet another fine article and analysis of this Brazilian team. I have to admit I was one of the skeptics in the past, wondering why they’d sacrificed the skill and tricks of the abovementioned Ronaldinho, Pato etc, but I now understand Dunga’s ideology and it seems superb. Looking forward to seeing them in the World Cup! This is a brilliant write-up. Good work. I have a feeling that it is the Brazilian media, not the fans, who are calling for all these changes. It’s not like Brazil play a long ball game or don’t have flair in the team. That second goal is not the work of an ugly team. The World Cup is a bit of lottery but Dunga’s Brazil are built to win knock-out competitions. Deadly on the counter, deadly at set plays, solid defense and tactically flexible. Dunga has found a way to make maximum use of Robinho without weakening the team. Just for that I applaude him. I think that’s a very good point about Robinho. He just hasn’t been given the right level of support from his managers – he was probably too good a player for Mark Hughes to know what to do with him, and his positional sense wasn’t helped by playing in the Galacticos circus for a couple of seasons. Dunga seems to be bringing the best out of him. Didn’t Brazil win the Copa America a few years ago as Robinho running the front-line? Mancini wanted to play him behind Tevez but the Brazilian wouldn’t accept the rotation policy that the Italian also wanted to implement. Robinho started well under Hughes, who to his credit, played him the Brazilian way with two “destroyers” (Kompany and De Jong) covering. Everything seems to be tailored to perfection from Dunga in knowing his players’ attributes very well. Though the only possible “imperfection” in my opinion, is leaving Dani Alves out of the line-up. From an outside perspective only, Alves doesn’t bring any flaws but instead improvements to Ramires. Alves isn’t one to be shy of defending since he’s naturally a full-back and his energy level to press infield and then out is also something he does regularly for Barcelona. Also, again from personal perspective, Ramires does at times seems to be shy of getting into more adventurous positions, even with both Gilberto and Melo covering. I thought the same about Dani Alves, but the one thing he isn’t used to having, is space behind him when is turned to the left. He tends to forget that there’s that lane(where he usually plays and all there is behind him is the sideline) and will often ignore Maicon’s run. Ramires has a better sense of space playing in that position, so it’s wise to keep him there for most of the game and bring Dani in when a bit more spark is needed. But just has to be at the right time I think. Looking at that analysis it seems as if Brazil are well set up to take on opponents who play in any number of formations, with the key being the ability to control the game in midfield. How do you feel that their greatest strength – their tactical flexibility – could be their greatest weakness. This Brazil team has no true style of play to impose on opponents, and I wonder how they would fare if they came up against a resolute but well organised opponent, like Greece in 2004. I am looking forward to Dunga coming up with solutions to ‘unlock the door’, as it were. As things stand, a Brazil Spain final in the World Cup would be a riveting match. Brazil’s reliance on the counter-attack is perhaps their main weakness. It would be interesting to see how they’d cope with a side ‘parking the bus’ against them, certainly. Well, Dunga has faced teams like that, but the South American qualifiers are tough to judge given the huge importance of home-field advantage (high altitudes in Bolivia, Colombia, for example). On neutral ground, I’d say the closest team we faced that did this “parking the pus” was probably the United States in the Confed Cup final, and we were able to overcome that. I mean, at times in that game, the Americans had literally 7-8 men in the box, although I still think that we were really in no danger of losing the game, even down 2-0, especially with the way we were wearing down the Americans. And on neutral ground, we DID lose to the Mexicans in 2007’s Copa America — a 2-0 loss was pretty humbling. Looking toward the World Cup and our path (I’m Brazilian), assuming we take our group, Switzerland honestly stands as a challenge given their defensive and organized style of play. And potentially Denmark. But I just don’t think these teams have quite the finishing to truly trouble us (Switzerland, I think just doesnt have a capable finisher — and they have aging forwards to boot; and Bendtner is only one man for the Danes). Looking further out, probably Mexico — but we play them so often that I’m not extremely concerned. They did several times in the South American qualifiers. Results; FOUR 0-0 ties at home, one against Argentina, and then later three against the likes of Bolivia (the only point away they managed in the entire qualifiers), Colombia and Venezuela. Well I think this is a different style of counterattack.. Certainly it is not the European style of counterattack. This new Brazilian style of counterattacking is a purposeful approach to manage the intrinsic Brazilian energy and let it go when the timing is right. Like compressing a strong coil and letting go when appropriate. Fundamentally, it looks like a 4-2-2-2, with Robinho given license to pull out to the left. I can’t remember the last time I saw Brazil player with proper, out and out wide players, rather than just letting their full-backs bomb up and down the flanks. That’s certainly true, and fair to say that this is a modification of the 4-2-2-2, but Ramires forms a clear midfield triangle when defending, so it’s not quite the same. And Robinho’s position is quite fixed, in that he doesn’t just pull to the left, he remains stationed there throughout the game, so it’s a strange two upfront. I think that taking into account that last statement of yours, there is no reason why Ronaldinho couldn’t be occupying that space. That is exactly what he has been doing for Milan the whole season. I think this is pretty spot on. And this is why I greatly respect Dunga as a coach. This type of flexibility that he has instilled is precisely what caused our downfall in 2002. He’s starting the right players for this system — and it’s worked flawlessly for the most part — although it hasnt looked pretty at times. In 2002, Parreira started the wrong guys and the system was just bad bad bad — and the only time he really strayed from it, it backfired (the 4-5-1 with Juninho shouldve worked, in theory, against France, but we had never ever used that formation). With respect to 2006, I think that had Parreira used the Confedertions Cup team (with Gilberto over Roberto Carlos, Cicinho over Cafu, and Adriano and Robinho starting up front), things might’ve turned out differently. And Kaka and Ronaldinho played fine together in that tournament — although that was the only time. The great thing about Dunga is that he’s experimented with his guys and used them in different positions. I think even at some point in the Ireland game, I saw Maicon playing on the left side. The players that he uses play specific roles and you have direct subs for most of the starters. I would say that only Baptista is the odd guy out — but he’s probably there just for his sheer physical strength. Kaka doesnt have a replacement and Ronaldinho isn’t quite the same player as Kaka. I mean, no team out there (with the exception of Spain) can replace a midfielder like him. I prefer Elano over Ramires, personally, but I think whoever Dunga starts will depend on our opponent. Elano is probably our best set-piece man (when it comes to crosses), but he’s more static than Ramires. So, our counter-attacking just looks different when either is on the pitch. Clinical passing from Elano or ant-like scurrying from Ramires. The one experiment that I do want to see is still at left-back. I want to see Thiago Silva there — because he occasionally plays that position for Milan. He’s a lot slower, but it’s probably worth a shot. With a more defensive player playing at that position, it leaves Brazil with the chance to have another more offensive midfielder on the left side of the midfield. Whoops. Typo. Should read 2006 and NOT 2002. Cheers for this Victor, really interesting analysis. Do you think Dunga should just not bother with a backup for Kaka? If he gets injured I’m not sure who in the current squad would replace him. I think Dunga will call Neymar as a back up for Kaka. that will only defend against us. I believe Diego of Juventus in Italy could play the Kaka role, particularly because he is also a very good passer of the ball and sees opportunities early. So instead of running with the ball like Kaka he would make early defense splitting passes to Fabiano or Robinho ala Fabregas in Arsenal. Diego would be much more effective at his role if there was a faster striker instead of Fabiano, but still Fabiano would do as he is quite efficient and deadly. I don’t know if you’ve noticed this already, but in terms of assymetrical structure the Benfica set-up is very similar to Dunga’s Brazil; albeit one with greater passing fluidity in midfield (compare Javi Garcia to Gilberto Silva as a holding midfielder) and the fact that the ‘third midfielder’ in Brazil’s side (Ramires) is considered strong enough to assist as the ’second volante’ with Benfica; all of which means that Benfica’s third midfielder (Di Maria) is liberated a genuine offensive-midfielder (some would even argue a forward). The rest is pretty logical: Aimar as No.10 (like Kaka, although more deliberative and less incisive than the great Brazilian), Saviola as outside-forward/mobile second-striker (similar to Robinho, though perhaps with more liberty to switch flanks) and Cardozo (Luis Fabiano)as a No.9. Please rememeber, I am talking in terms of style and not in comparative quality. Whilst I appreciate the mechanical coherence of Dunga’s system (excellently organised), I just wish they could incorporate a more distributive holding midfielder in there (in place of Gilberto or Felipe Mello); that way, Brazil could preserve the same structure, whilst adding more variety to their movement especially when needing to break down more defensive teams or even for maximising possession against teams who are technically excellent (Spain, Holland). Of course; then they would be unstoppable in every aspect of their game. Yeah interesting points there, I hadn’t considered the similarity, but I suppose that there’s a fair similarity. The main difference as you say, is the double holding role for Brazil, whereas Benfica’s is a traditional, more attacking diamond. I think Pheteesh point is spot on about the switch to the back three, too. I don’t think there is much similarity upfront, though. Saviola plays as a classic second striker and has ‘license’ to drift wide, whereas Robinho’s position is actually quite strictly defined, he never really drops deep or moves more centrally off the ball. I agree about the three man defence. Gilberto Silva drops either between Lucio and the space vacated by Maicon to become a defensive full-back. Alternatively, he takes Lucio’s position in the back line whenever Lucio surges upfield through the middle. Lucio playing the ball out from the back; defensive diamond [Lucio, centre-Juan, left - Gilberto, right- Felipe, deep midfield]. The key here is for the opposing forwards/advanced mids to cut off Lucio’s passing options by a) pressing Melo and forcing him to panic and b)moving into the space between Lucio and Gilberto. Thereby forcing Lucio to spread his pass wide to the right (towards Juan, or a long speculative ball further up to the left-wing-back). Of course, the opposing midifeld should shore up this flank agaisnt Michel Bastos. But my point is to show how Brazil could be forced to aimlessly recycle these passing movements from left to right without actually delivering a quality ball out of defence. Also, whenever Brazil lose possession in midifeld, one of the opposing attackers (be he a striker or a winger) should move into that vacated space behind Maicon before Gilberto has time to cover (taking advantage of his slowness. Wouldn’t a more creative holding player take away the option of switching to a 3-5-2 during the game? I thought one of Gilberto Silva’s advantages is that he can play as an extra center back when both wingbacks push up into midfield(as shown above) ? Melo is too much of a headcase to play the defensive role on his own. Who would you recommend for this more creative role? I think Dunga has nightmares about being hit on the counter attack so he will stick to his double pivot. Failing that, perhaps Anderson or even Elano, which I know sounds a bit improvised but remember that this figure would be accompanied by a destroyer. A more defensive option would be Fernando of Porto. hey zm another great write up. i personally think of dani alves as one of the most valuable players in world football, and i cant see how he can be left out of this team. can’t he play at left-back? zambrotta was successful for italy in 2006 playing on both flanks, cant he do the same? he’d probably even do better in midfield as a replacement for ramires. also, what do you think of felipe from deportivo? a better choice than bastos? marcelo? I must say, I too have considered that Alves might be a good option for the left-hand side considering Brazil’s lack of a clear first-choice there. Perhaps Dunga wants a left-footer there. But Brazil do have options there. Maxwell of Barcelona would be a decent choice, for example. I haven’t seen Felipe enough to judge him, personally. That said, Bachos looked good in that position. He’s excellent on the ball, but he might face problems against a tricky right-winger. its a 4-2-3-1 formation which is becoming more popular in the modern game. Still think theres room for Ronaldo, Ronaldinho and Pato. Should have included them before now. Probly have Elano over Ramires and maybe Maxwell instead of Bastos. Gilberto Silva very intelligent player and Lucio possibly best centre back around. But it’s not simply a 4-2-3-1, which is hopefully what the article is outlining. Look at the position of Ramires when Brazil are not in possession, for example and he plays as a central midfielder. I’m beginning to appreciate that Dunga has a method in his madness. I particularly like the balance in the side with Maicon and Ramires bombing on down the right, able to rely on cover from one of the two volantes, and a creative player forward on the left. Yes, Dunga needs to solve the left back problem but it’s not a fatal flaw. 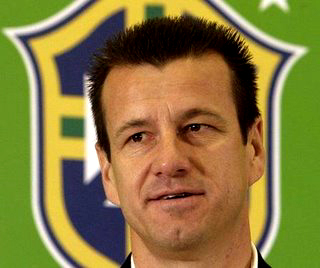 Dunga reached the nadir of his popularity in 2008 after three consecutive goalless home draws. OK, one was against Argentina but the games against Bolivia and Colombia were without any redeeming features whatsoever. So, what should he do against a team that ‘parks the bus’? For these games, playing two holding midfielders is surely excessive. Given that Hernanes doesn’t seem to be in Dunga’s plans, I’d like to see Dani Alves come in for either Felipe Melo or Gilberto. He played in midfield in the 4-2 win over Chile and added a considerable attacking threat. They’ve been very disciplined and structured as per Dunga’s ideas and tactics. I do think though that ramires could be replaced with Alves and it would probably add to their threat rather than diminish it, or as cantagalo points out – to include Alves at the expense of Melo for teams that set out to defend. I’m also hoping ‘fat’ Ronaldo maintains his fitness and makes the team, as he will always score goals – although he would now be less mobile or couldn’t be arsed to work in general play compared to the other strikers competing for the position. Perhaps a place on the bench to come on and kill a game or ‘cherry-on-the-top’ it? Correct me if i’m wrong, ZM, but isn’t this same system being employed by Real Madrid. In their case, Ronaldo is Robinho (a much better version), Kaka is still Kaka, Higuain is Fabiano, Lassana is Gilberto Silva, Xabi Alonso is Melo, Granero is Ramires. The only distinction I see is that Maicon and Lucio are streets ahead of any of Real Madrid’s defenders. I think it is a wonderful formation. Tough to organize and it speaks volumes for Dunga as a coach that he is able to get it working despite being an international manager and having very little time with his players. How do you make your formation diagrams? Do you have a program, or is there a website? Nothing more advanced than MS Word…! i haven’t seen this brazil side play much, but the strategy seems to be designed to isolate the right-sided CB against Kaka running at him with speed. it’s also interesting how gilberto slots in to the right-side of a 3-man defense, whereas usually the holding player drops back while the two CBs push up and out to either side of him when in possession. is this unique to this dunga’s brazil or is this quite common for south american 442 diamonds? Yeah, the Gilberto question is interesting. Actually, a couple of times he did come into the centre, but because he was always drifting to the right to cover for Maicon, he generally ended up at RCB. Who I am to send a comment about this post. Iam here only to congratulate you and this magnificent website for such a terrific job at analysing the games. You see stuff people think they see they don’t actually see. It’s crazy. Congratulations and I wish this website earns lots and lots of recognition. I’ll help. As much as I can! Thanks very much. I hope the Brazilians can learn to love this Brazil side, I wish England could play like this! I’m brazilian and I admit we kind of ‘hate’ Dunga’s ideas and ideology. Howhever, we have a lot of difficult to score when we face more defensive teams. In these games I think i’d be good to have Ronaldinho or Dani Alves on the midfielder. Hi, I discovered this website, yesterday, through a newspaper in portugal, who brought to attention, the porto of mourinho, since, i am a football lover and a strong porto supporter, I took a look, and I now feel the need to congratulate, few commentators in the world, analyze, so well and in such a detailed way matches and teams. I didn’t like dunga’s brazil, for it’s “negative football” based in counter-attacking; my opinion changed when I saw them play in the confederations cup. and this article made me understand, in a deeper way dunga’s brazil. personally I prefer dani alves to maicon, he’s faster, and more technicall, I don’t think maicon is all that better defending, I think dunga prefers him, because of the fisique he has and apply in all matches. Finally, how do you see an inclusion of hulk in this team, it would be interesting since there isn’t any other brazillian player that has the attributes that he has. Yeah, Dunga is probably playing safe but good football with the counter attacking method but… The last world cup was so defensive it looked like castle seizing, if this happens again then teams like this Brazil, Netherlands, Portugal (wich for a fact got themselves in trouble against much better defensive teams in qualifiers, i´m portuguese so…) will probably get some hard times. If the world cup will be a world cup of football then this Brazil will have pleanty to say! Hi, great article. I thoroughly enjoyed it, but remain sceptical about you hesitating to number the defence-midfield-forward combination correctly. For me, Dunga is playing a 4-4-2 version based on the characteristic of players he considers best in Brazil. He chose Fabiano and Robinho as best, so he devises their play to best suit each other. But for Dunga, being best includes playing with speed/power and high work-rate. Even Kaka is strong for a playmaker, and Robinho doubles his effort when playing for Dunga. The problem with character-based teams is that they’re hard to duplicate when cards and injuries arrive. Its fine to have this starting-11. But Dunga MUST find another-11 which includes Ronaldinho/Pato at least. You can’t only have one system when you’re so blessed with character rich players. If I was Dunga, I’d have a 4-3-3 up my sleeves where three holding midfielders lock the field for two full-backs to exploit either side of a Pato/Robaldinho/Adriano switch-board. I agree for the most part. Brazil’s starting 11 is very very good and while Dunga’s team has depth, his reserves don’t necessarily replace all the starting pieces. And really — that main problem is Kaka. We dont have a replacement for him now — Baptista and Kleberson are not the answer — and if we go by the team that was used against Ireland, these guys would make the WC squad. Diego won’t be used and honestly, I don’t know who else Dunga would call up. I would hope for either Ronaldinho or Ganso (the young midfielder from Santos) for that role. Alex from Fenerbahce has been sensational this season but he is way way way on the outside. Basically, if Dunga didnt use a player recently, he won’t get called up. It’s both fair and unfair and I can see both sides. But, Dunga has roles for his starters and reserves, and I think that’s fine. Nilmar for Robinho. Adriano for Fabiano. And on defense and most of the midfield. It’s good I think. Pato, I don’t think has much of a shot simply because of his injury status at the moment. He might feature in the final few games. It would take a sensational performance and I doubt that’s enough. Ronaldinho is at the mercy of Milan too. He’s the only guy right now on Milan pretty much and he can’t do everything, so I’m not sure. But I hope he makes it. Hopefully common sense prevails. The guys that really intrigue me are from Santos. First off, Robinho has been great and he’s really changed this team. I think he’s set to star in the WC to be honest. But it’s the youngsters. Ganso I already talked about. But Neymar. MAN! He’s on fire — scored 5 goals yesterday and couldve had like 3 more goals even. He’s been sensational and I think as a creative element, it might be a good idea for Dunga to call him up. I mean, he’s more of a Robinho/Nilmar, but I think he could play on the right side. The pressure will build now, especially, for Dunga to call up Neymar. hello Victor, I’m looking forward to seeing Ronaldinho in SA, and if Neymar is as exciting as you say, then we must expect surprises from Dunga’s Brazil. I hope Dunga reads your comment. Football fans want to see other options from Brazil. I took a picture of the Brazilian team (although not vertical)during the FIFA Confederations Cup against the US. I would like you to post it for further analysis. Perhaps I could PM it to you. @OLI – Take a look at paint.net – great for coaches who want to prepare training sessions. And it’s free. But how to cope with the unexpected absence of kaka? 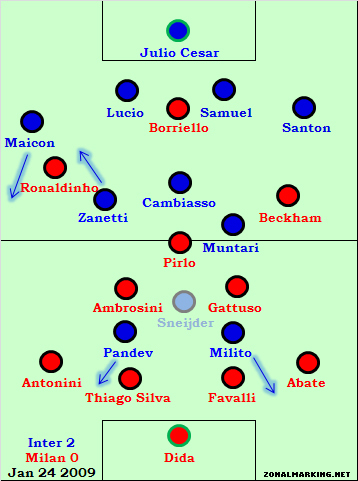 That last reference to a past Selecao side featuring four forwards, Kaka, Ronaldinho, Ronaldo and Adriano, is similar to Roma’s recent playing of three forwards. Both experiments ended in disappointment. Would anyone know a success story when such a strategy was implemented, either at club or national playing level? To be honest, the brazilian press and fans criticize individual player choices, not the team’s style of play. Specifically, Felipe Melo and Gilberto Silva are criticized for not having played well in their clubs for a while now, and Dunga gets heat for ignoring star players to compose the bench. For instance, it is quite unanimous that the perfect substitute for Kaká would be Paulo Henrique Ganso, from Santos, as he is also a deeply inteligent and tecnical player. However, the chances that Dunga will call him are quite slim, as the coach is too stubborn to make changes in his group so close to the Cup. Most fans agree that Ronaldinho or Neymar should not be on the starting squad, but they also all agree that those players are fantastics weapon to be used when Kaká or Robinho are not well, because the team do rely heavily on them to make the big plays on tough games. I, for one, would not mind to see Thiago Motta and Hernanes (or Elias) playing the defensive mid-field role instead of Gilberto and Felipe Mello. It’s a matter of choosing players that are on a much better moment. Hernanes and Elias can defend well as second volantes and are knows specialists in shooting from distance and making 1-2 plays – critical outs against the strong defences that Brazil is bound to face in South Africa. Dani Alves should play left sideback. He is too good to be left out. Even though it is an improvisation, so is Michel Bastos. Roberto Carlos is playing so well again, he is another strong bench choice that Dung won’t ever consider. Does this not resemble the alternative shape for Barcelona????? The problem with Diego is that he just hasn’t played well for Brazil. Ever. I mean, I can’t quite put a finger on it. But I do know that he’s struggled mightily no matter the coach for Brazil. His crowning achievement was the Hail Mary pass to Adriano in the Copa America final against Argentina. For the most part, he has looked very ordinary for Brazil, both at the youth levels, the national team — and when it mattered most in recent memory — at the 2008 Olympics. He’s also been very inconsistent for Juve — from his stunning debut to the ups and downs now — although this might have more to do with the team’s general poor form this season. I really want Dunga to look at more guys out there — but I think he’s steadfast in picking from Kleberson, Baptista, and hopefully Carlos Eduardo, who received a late call-up for the Ireland game. Yeah, it’s hard to see Diego getting a place. Poor shows for Brazil and poor form this season – it’s hard to make a case for him, as naturally gifted as he is.